Target heart rates let you measure your initial cardiovascular fitness level and monitor your progress in a fitness program. This approach requires measuring your pulse periodically as you exercise and staying within 50 to 85 percent of your maximum heart rate. This range is called your target heart rate. Heart rate monitor training, or heart rate zone training, is an effective training method and approach, to maximize the benefits of cardiovascular exercise. One of the best ways to monitor your ideal heart rate zone is with a heart rate monitor. Very often when I train clients, instruct a cardio group or indoor cycling class, I will use and refer to RPE, or " Rate of Perceived Exertion". In the chart below you can see various RPE levels. To use target heart rate training simply use the formula below, to first find your maximum heart rate. Estimated Maximum Heart Rate: 220 minus your age This is a rough estimate and can vary in some cases. Find your THR for Aerobic Exercise. My Target Heart Range for aerobic exercise is between__________ and __________ beats per minute. 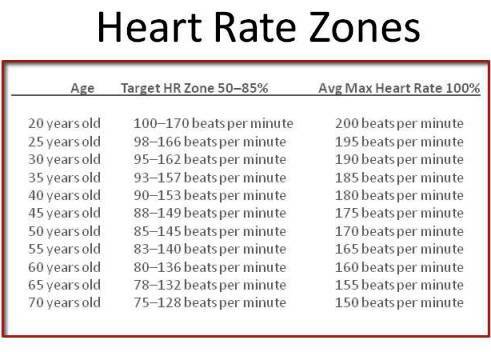 Below is a chart of Ages, Target Heart Rates Zones and Maximum Heart rates. Another very effective method of calculating your target heart rate zones is by the Karvonen Formula. This formula takes into account your resting heart rate (RHR). Knowing your resting heart rate helps you to determine your Heart Rate Reserve (HRR) or working Heart Rate. Heart Rate Reserve (HRR) or working Heart Rate the difference between the Maximum Heart Rate (MHR) and Resting Heatt Rate (RHR). The greater the difference of your MHR and your RHR the greater your HHR or WHR. This is important because this tells you how great your heart rate intensities can be. The best way to measure your resting heart rate (RHR) is when you first wake up in the morning and before you get out of bed. Simply count your pulse for 15 seconds beginning on the zero count and multiply by 4. You can do this for 5 days and then average the results. This is your resting heart rate. Keep in mind that lack of proper rest, stress and lack of proper nutrition, and medication can influence your RHR. One sign of over-training is an elevated RHR. You will also notice that using the Karvonen Formula the percentages of MHR will be higher. This is because this method indicates more closely your actual VO2 Max. VO2 Max or Maximal Oxygen Consumption is the total capacity to consume oxygen at the cellular level. This represents the total maximum aerobic capacity of the muscle cells. Once you know your percentages of max heart rate then you can exercise according to your goals and fitness capacity in the following heart rate zones. Zone 1 (50 - 60% of MHR) - The lowest level you can exercise in and still increase fitness levels. For beginners or people who have not exercised for a long period of time. This zone can be for just improving your overall health. It can also be a good recovery zone for people who are over-training and need to take a break. This mode is also good for people who want to lose weight as the main source of fuel used by the body is fat stores. Zone 2 (60 - 70% of MHR) - This is the target heart rate zone where the heart begins to benefit. Training in this zone will begin improve your hearts ability to pump blood and improve the muscle cells ability to utilize oxygen. In this zone stored body fat is the primary source of energy utilized hence this zone is referred to as the weight management zone. This is a good zone for long slow distance exercise as the body becomes more efficient at feeding the working muscles more efficiently especially with fat as the main fuel source. Zone 3 (70 - 80% of MHR) - This zone is the most effective for overall cardiovascular fitness and is often called the "aerobic zone" or "target heart rate zone". This is the optimal zone to workout in to increase your cardio-respitory capacity or the bodies ability to transport oxygenated blood to the muscle cells and carbon dioxide away from the cells. After a while you will be able to cover more distance during workouts in less time. Your body will burn less glucose and more stored fat as fuel thereby working more efficiently. This zone is also effective for increasing overall muscle strength. Zone 4 (80 - 90% of MHR)(85-90%= Anaerobic Threshold) - this level is where you cross over from aerobic training to anaerobic training which is called the anaerobic threshold or AT. This is the point where the body cannot effectively remove lactic Acid from the working muscles quickly enough. Lactic Acid is a by product of glycogen consumption by the working muscles. This zone is primarily for people who want to increase their performance levels. You would characterize this zone as hard. During this zone your muscles are tired, your breathing is heavy and your fatigued. The benefit of training in this zone is you can increase your bodies ability to tolerate and deal with lactic acid for a longer period of time as the enzymes in your muscles responsible for anaerobic metabolism are increased. For competitors it is good to know your anaerobic threshold as many fit athletes can compete at or about their anaerobic threshold. 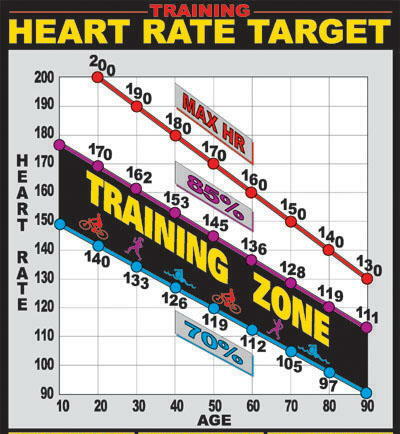 Zone 5 (90 - 100% of MHR)(VO2 Max) - You will only be able to train in this target heart rate zone for short periods of time. You should not train at this level unless you are very fit. In this zone lactic acid develops very quickly as you are operating with oxygen debt to the muscles The value of training in this zone is you can increase your fast twitch muscle fibers which increase speed. 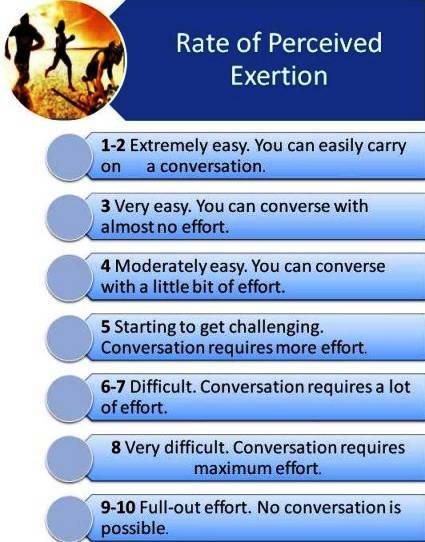 You will not be able to stay at this level very long and should be used in intervals or sprinting work at the track. It is always good to know your resting and Target Heart Rate. Exercising at the right intensity, for the right amount of time, and the proper frequency is the secret to maximizing your cardiovascular workouts. Be sure to consult with your doctor before beginning any exercise program. Remember to do aerobic exercise for AT LEAST twenty minutes - to get into your fat burning zone! Visit my Fitness Store link under, "Exercise Equipment" for personal Heart Rate Monitors. Visit my Kettlebells or my Aerobics for some heart pumping cardiovascular exercises !